We are finally making progress on updating the kitchen and boy it already looks so much better . 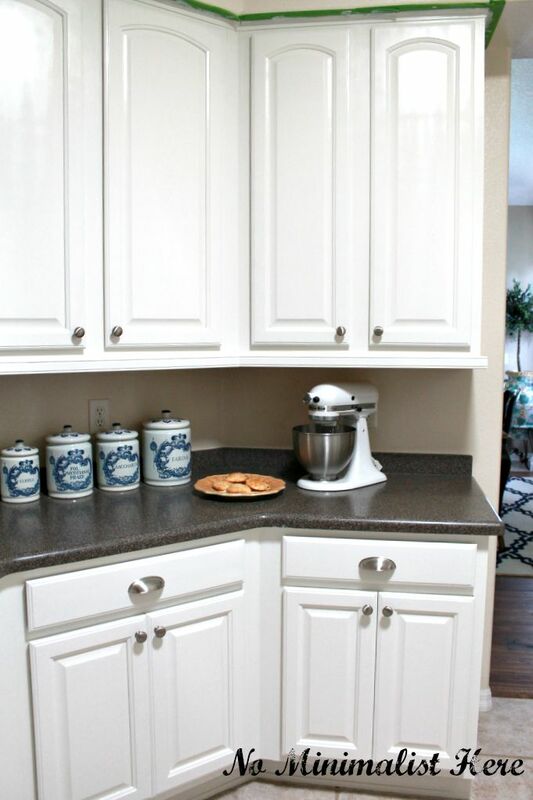 I am loving the white cabinets and the tile is FABULOUS! The kitchen and eat-in area are so much brighter, now the rooms blend better with the rest of the house. Our kitchen has a solar tube, which gives wonderful light, but it does make it impossible to get a picture without the glare. Steve has been out of town for two weeks so my son stepped in to lend me a hand. We actually got quite a bit done today. I am giving you a glimpse and hopefully I’ll be back soon for the final reveal. The tile looks darker in the picture than it actually does in person, Next up is grouting. Here was my original plans for the kitchen and the progress we have made. I’ll be back with a complete source list soon. Now, I have to get back to painting the crown molding so we can install it tomorrow. Thanks for visiting and I hope to see you here Wednesday evening for the Share Your Style party. We spend so much time in our kitchens that it's really life-changing when they feel good! Yours looks beautiful and I'm happy that you're getting it done! Have a great week, Sherry! 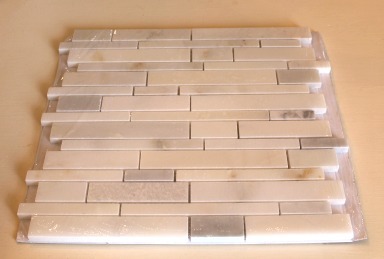 wow Sherry, your cabinets are gorgeous and I love the wonderful marble tile! you did a beautiful job on the paint. I know you must absolutely love them! Sherry- It looks great. The white is so light and fresh. I cannot wait to see the final reveal. Looking great so far. The cabinets and tile are wonderful. 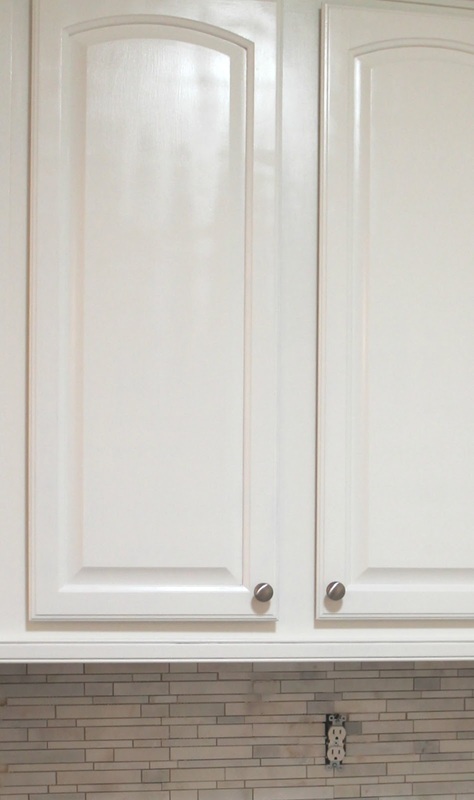 Oh my I love your painted cabinets, I will also be painting my kitchen cabinets in the near future any tips will be greatly appreciated….. I love your back backsplash it's all turning out so beautiful…..
Love it Sherry!….been away for a while and catching up….love that marble backsplash!! Your kitchen is looking beautiful! It's a good feeling to do so much yourself. I LOVE the backsplash! We are doing our kitchen at our lakehouse and I love seeing what others are doing. I love everything so far and look forward to the reveal! It's looking so good! I'm a big fan of white cabinets. I like your hardware too. I know you will be glad to have it all done soon. It's looking so good Sherry…can't wait to see more!! That backsplash is just gorgeous Sherry – do you find yourself walking in there often during the day to just stare at it ??? You are making great progress in the kitchen Sherry. I love the tile you've used! I hope your mother-in-law is feeling peaceful and that the family is holding up well. Sherry, it looks gorgeous! I love a nice bright kitchen.